Show Me The Movies: Review - A Quiet Place - A terrific tense horror thriller that will haunt you for days! Review - A Quiet Place - A terrific tense horror thriller that will haunt you for days! With the recent critical and commercial success of films such as Get Out, It Comes at Night and The Witch, the horror genre has enjoyed a rebirth in our cinemas with audiences flocking to see a new wave of more thought provoking and understated horror films that not only rely on the jump scare but are more reflective and multi-layered and as a result leave a much more resounding effect one the viewer. John Krasinki's A Quiet Place is a prime example of this new wave of film and one that sits comfortably in the company of the strong thrillers that have follwoed before it. The premise of A Quiet Place is quite simple - in this modern horror thriller, a family of four must navigate their lives in silence after mysterious creatures that hunt by sound threaten their survival. If they hear you, they hunt you! In a world where even the faintest sound can get you killed, director Kraskinski relys on the camera to build the tension and he does that superbly with silence the perfect ingredient to build tension throughout (during the screening I attended you could hardly hear a pin drop from start to finish). With minimal dialogue, the film is completely reliant on strong performances from it's cast and in this case they all deliver emphatically with Emily Blunt and Millicent Simmonds in particular contributing to what is a nerve shredding ninety minutes of superb cinema. As frightening as this film is (you will not feel comfortable in your plush cinema seat - even for a second!) it is the drama, heart and unconditional love at the centre of the story that elevates this feature from one that is simply a shock fest to one with that resonates long after the end credits roll. 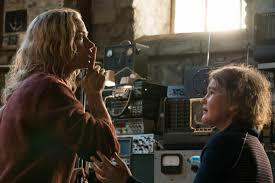 Not being a huge fan of the horror genre and despite shifting uncomfortably in my chair throughout , I have to admit that A Quiet Place was a lot more than a simple scaremongering exercise. It is similar in many ways to Jordan Peeles Get Out which was a huge hit last year, insofar as, despite an incredulous and implausible premise with the help of a sharp score, some high quality performances and a director that throttles the audiences attention A Quite Place may just turn out to be one of this years best. Highly recommended!